After 30 years of living in California, Georgianna (Annie) Kershaw moved back to Illinois and began urban farming on her Family Century Farm. “After growing up on a farm, agriculture seems to stay in your bones. You learn so many life lessons” says Annie. Upon her return in 2014, she began growing heirloom tomatoes and vegetables and producing eggs and honey. Annie also caters with a local company doing both corporate and private events. This past year, she worked closely with her brother, Dan, who grows corn and soybeans. Annie took this opportunity to learn more about production agriculture and gain a be tter understanding of the Farm Bureau. This is Annie’s 4th year raising bees and producing honey. 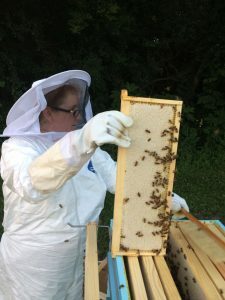 Each April, she purchases a package of commercial bees, which includes a queen. “You put your bees in brood boxes, wait a day or two, and hope they take to the queen” Annie says. “If that happens, then the queen will start laying eggs and produce more bees.” Annie monitors the queen’s laying patterns and the building of honey comb on the frames. In May and June, the bees gather pollen and build comb on “supers.” These are small boxes on top of the brood boxes where the bees will put their honey. By the end of July, the bee hives should have doubled in size, honey should be stored in the brood boxes, and the bees will start filling the supers. Once the supers are full, Annie extracts the honey using a 4-frame extractor. At the end of September, she removes the supers and lets the bees finish building their honey supply for the winter. The boxes weigh between 70 and 80 pounds for the bees to have enough honey during the winter.